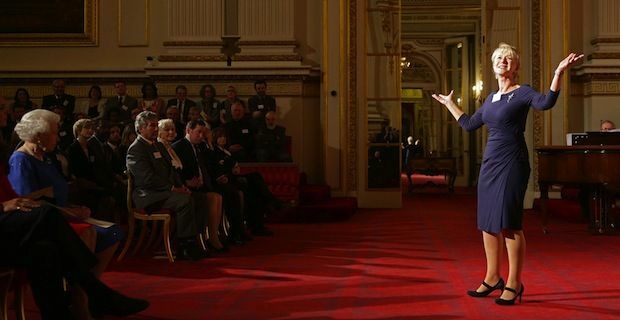 Queen Elizabeth hosted a gala event for some of the best and brightest in the world of acting. Stars from both the stage and big screen attended the party at Buckingham Palace in a celebration of UK drama. The Duchess of Cambridge, dressed in a gorgeous red dress that lit up the whole occasion, joined the Queen in hosting major celebrities such as Dame Helen Mirren, Sir Michael Gambon, Joan Collins, Sir Roger Moore, Helena Bonham Carter, Uma Thurmand and John Hurt. Also at the party were Ralph Fiennes, Alan Rickman, Gemma Arterton, David Attenborough and Hugh Laurie. The strong turnout from the stars was complimented nicely by the current batch of students from the Royal Academy of Dramatic Art who linked up for a performance of The Tempest with Helen Mirren. Dame Mirren, who has played the Queen both on stage and on screen, was thrilled with her meeting with the Queen saying "How delightful she was. Very sweet, I am genuinely always astounded by her aura, her twinkle, her presence.". Gemma Arterton was giddy at completing her "collection" of Royal meetings. She beamed “I’ve met most of the Royal family but I’d never met the Queen. Now I’ve got the full set.”.